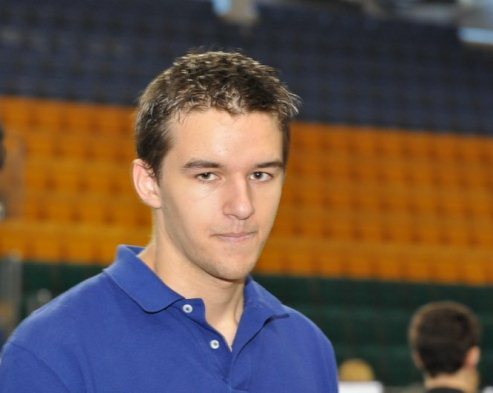 For his third letter from the European Individual Chess Championship, Sergey Shipov addressed the issue of 20-year-old GM Sebastien Feller, who’s taking part despite having been found guilty of cheating at the Olympiad in Khanty Mansiysk by the French Chess Federation. Sebastien Feller was sentenced to a 3-year ban followed by 2 years of “community service”. 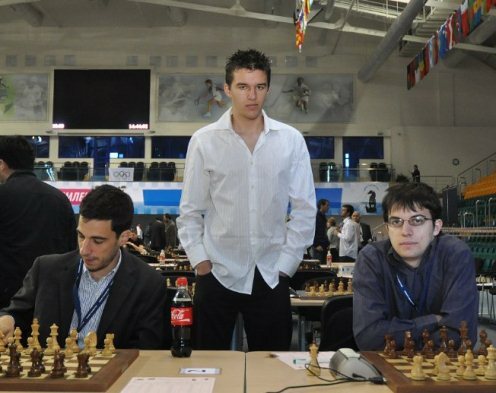 His alleged offence was cheating by making moves indicated to him by French team captain GM Arnaud Hauchard, who received computer recommendations in text messages from IM Cyril Marzolo. The scandal has, of course, been reported by the chess press (e.g. at ChessVibes), but has also made it into the wider media. The BBC, for instance, got a little confused by the method of cheating – Arnaud Hauchard would have needed to find 64 chairs he could sit on! It’s something of a surprise, therefore, that Feller chose to run the gauntlet of appearing at the European Championship. 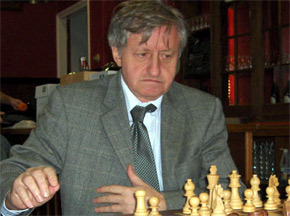 At the same time, however, it’s a challenge for his opponents, as Sergey Shipov points out below. At the time Shipov was writing Feller had won one game and drawn the second. 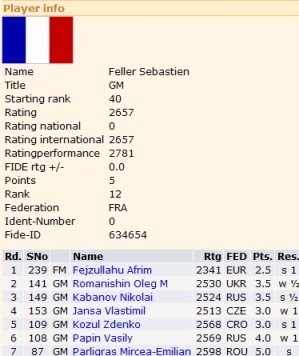 As you can see from Chess-Results, Feller has since done very well, and is currently in joint 2nd place, half a point behind Vladimir Potkin. Sergey Shipov’s original letter in Russian can be found at Crestbook. “Ch” is a single letter in Russian, and “cheater” is a word that’s been borrowed from English. 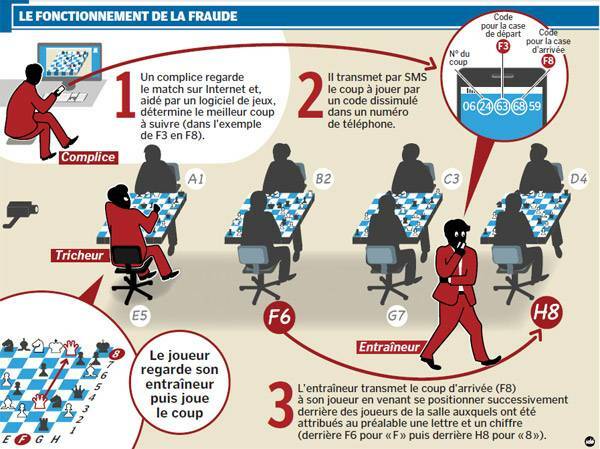 I must admit I haven’t followed the details of the case closely, but the outcome is known – the French Chess Federation, having judged the accusers’ evidence to be compelling, has disqualified Feller, but… But then the accused’s lawyer appealed, and in accordance with the law the sentence was suspended – therefore the alleged cheater got the chance to play in the current European Championship. The law, by the way, is good! Until the courts have finished looking into the case, appeals, complaints and other such minor documents, the accused is pure and innocent. I’ve got the suspicion that a strict, formal review of the case in a civil court will lead to an acquittal, even if there’s clear cheating. What won’t people say! Perhaps enemies and jealous people are slandering a successful chess genius? Where’s the direct proof of cheating? Who’s been caught red-handed? With his hand in the till, so to speak. During the game! They say N text messages have been discovered, in which the moves were transmitted. But, forgive me, does the court have the right to use private correspondence as proof? And who gave the telephone companies the right to reveal the contents of their customers’ communication? And, perhaps, among lovers who know chess, the telephone phrase “13. Nd5” means I kiss your ear, my stallion. Thirteen times! They also say that during the game Feller was shown the computer-approved moves by some kind of magical signs. But perhaps his friend simply had a bad itch that day, and he was forced to make intricate movements in order to alleviate his suffering? They also say that Feller’s games played at the Olympiad were given to Bacrot to look at – to provide an expert opinion. And he said, it seems, that Sebastien played well, and his opponents – badly. That’s all! And that’s right. Strong moves aren’t, and can’t, be banned. Until the code of chess and the FIDE handbook contain rules saying that it’s forbidden to make more than 15 moves in a row according to the first line of this or that program – until then strong play can’t be a proof of cheating. In general, it’s a murky affair. But at the same time, what stands out is that for the first time a known player has been officially judged to have cheated. Earlier precedents – a German amateur in his fifties, declaring mate in 8 moves against a grandmaster, and an unknown Arab youngster, hiding a receiver in the folds of his clothes – those were small signals. The current situation is much more serious. But let’s return to the European Championship. The question arises – how can you play against Feller? The terrifying thing isn’t that he really might cheat here as well, but that the suspicion puts tremendous pressure on his opponents. It acts on their will, affecting their style of play. It’s one thing to play against a living person, capable of blundering at any moment. It’s something else entirely to compete against advanced players. You can’t sacrifice pawns against them, entering complications is dangerous, and therefore you have to suppress all your creative instincts. Instead of a living face across from you your imagination paints a computer tower with flashing lights and the rattle of the ventilation fan. It’s a nightmare! Thank you, Oleg Mikhailovich Romanishin. He probably wasn’t up-to-date on the recent publications and gossip. And therefore in the second round he managed to play Feller at normal human chess – and was able to hold on, despite having had an extremely unpleasant position. 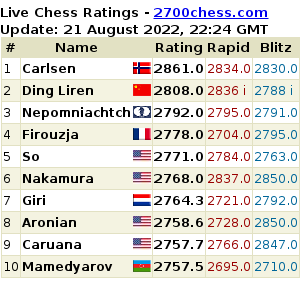 Now it’ll be much easier for the future opponents of the young chess genius. There’s hope of a fair fight. After all he’s not an idiot, and in such a delicate situation he wouldn’t repeat his past deeds… if there were any. IDIOT NO FAIR FRANCE !